As a nurse we all go through the ‘transference’ lecture. We are told to provide compassionate care to our patients, but don’t get ‘attached’ and WHATEVER you do, don’t make it personal. 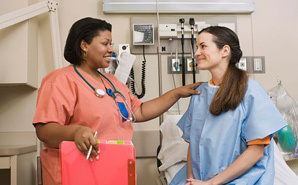 You can be personable, but be sure to maintain the lines of professionalism throughout the delivery of your care. This has always been a ‘sensitive’ subject for me as a nurse, since I don’t believe anything they warn you about in nursing school about transference. I think we all have the brain capacity to understand when we are oversharing or crossing the professional lines. To not ‘share’ with our patient denies your patient the very thing that separates our profession from all others. No other profession gets to do this on a consistent basis. We get to share. We get to make that human connection that others only hear about. By sharing with our patients we strengthen that bond and relationship. The patient trusts us more, the patient’s confidence in our skills and knowledge increases, and by golly the patients actually enjoy our presence. As opposed to the opposite. If you don’t share on some small level with our patient and find that common ‘human’ ground, your patient will not find the need or want to share their health and medical challenges with you, they will grow weary of your ability to care for them properly, and well they just won’t want you around. Lets face it, the skill set of a nurse are not discredited simply because you didn’t ‘share’, but the patient’s perception is there reality folks. Convincing a patient you are qualified to do the job takes more than simply hand-eye coordination. The last one is important for many other reasons, but mostly to keep the communication lines open and free. I don’t think I need to comment on how difficult it is to care for a patient when communication breaks down. We have the professional responsibility to do the job we were hired for, but in order to do that job effectively their HAS to be a level of personal ‘touch’ that augments the whole didactic relationship. I can’t honestly think of having any other type of relationship with my patients? Do I tell them my inner most personal secrets? Divulge the hush-hush things I only tell my family or close friends? Confide in them my most personal feeling? That’s the key. You need to know the limit. There is sharing, then there is oversharing. In this day and age of the internet, social media status updates, and mega-information overload out there, I think everyone understands the boundaries. The difference is, some don’t know how to stay within those boundaries. If you’re unsure, then that is cause enough to not do it (or say it).There is a fine balance between sharing and oversharing. A word to the wise would be to stay in control of the ‘distance’ you have between you and your patients. It’s really that simple.